A very clear and interesting piece about histamine intolerance can be found at allergynutrition.com. I especcially like the picture, that shows how the threshold can get passed, as a bucket model. The bucket slowly fills up with histamine until it streams over, and symptoms come into existence. The bread is rather easy, though may only seem as such, most bread contains yeast and some additives which should be avoided. I personally just added eating some more crackers, matze’s and rye bread, instead of stopping eating my favorite bread, which does contain some additives. Luckily I can handle it. What is allowed are self prepared breads, pastries and dough from allowed ingredients. One of the main articles written about histamine intolerance, is written by Laura Maintz and Natalija Novak. Both have an extensive background in allergic and immunologic topics. The article is freely accessible, and probably one of the main items people find when searching for information about histamine intolerance. Only published about 2.5 years ago. And hopefully has brought a lot of awareness about histamine intolerance. For those that hadn’t yet found it, go read it! Even though it’s written in scientific jargon, it’s still an accessible read. The article contains loads of information, and every time I read it, I’ll learn something new out of it. The meats comes down to only fresh, unprocessed, unsmoked, unaged, uneverything meat. Just pure and fresh meats, and be especially careful with seafood and pork. Weirdly I’ve started to eat a lot of fish, I was told these are generally okay when frozen. So I stocked my freezer with loads of bags of frozen fish from the supermarket. As with chicken, I love how I can just throw it the oven with some herbs, or put them in the tajine. List from Dutch nutritionist society. Over the veggies most lists advice the same. Since there are many, many vegetables allowed, I only counted those from the forbidden sections. Always mentioned are eggplant, tomato, sauerkraut and spinach. Often are pumpkins, mushrooms, pickled and canned vegetables and soy products mentioned as well. The nutritionist I see allows me to eat most of the beans and vegetables from cans, glass and when dried. But these are not okay if they come with additives, sauce and/or herbs. She’s also the one behind all the ok’s in the legumes section. I buy most of my vegetables fresh or frozen. So haven’t yet tried if these are indeed alright to eat. She also only wants me to avoid champignons (White buttons) in the mushroom section. The heated eggplant thing also comes from my nutritionist, apparently with cooking the molecule that works as a histamine liberator will fall apart. It’s most often mentioned as a histamine containing vegetable though, so once again she left me wondering. I don’t like eggplant anyway, so I wouldn’t want to try either. What I did try, but is not written down, is she allows Italian tomato’s if sieved. I must confess these give fewer problems, but can still make me itchy. I wanted to examine the diet somewhat closer, but since there are so many foods, it’s broken up in parts. The fruits come first, since I personally really like fruits, and got rather tired of the apples, pears and grapes I mostly ate. One thing that I learned from this is that melons are okay, and watermelon seems to be as well, though many of the dutch resources say that these no good as they contain histamine liberators. I have googled for some dietary lists, at the end of the post the used ones are mentioned, and counted the times fruits are mentioned as either allowed or restricted. A ‘v’ is allowed and ‘l’ is not allowed. Pineapple, papaya, strawberries, cranberries, plums and avocado are almost always mentioned as high in histamine or histamine releasing factors. Citrus has histamine releasing capacities, and generally should be avoided as well. Though some just caution but promote moderate consumption of these fruits. Bananas seem to be highly controversial, some lists say these are okay, others put this in the avoidance zone. Also controversial are kiwi’s. Opinions over stone fruits like apricot, cherry, nectarines and prunes also vary, from okay to bad. I think for certain of these, like apricots could be okay if eaten while fresh, whereas the dried version will have accumulated more histamine, since the dried version is often on the restricted side. On the list from my nutritionist dried apricot, raisins and figs are allowed if these are without sulfur. And please don’t ask me why strawberries are ok if they’ve been washed by hot water, maybe the thing that triggers mast cells to release histamine is located on their skin and easily flushed off with hot water? Couldn’t find any mention of this with a quick search. I ate a few strawberries last summer, but had taken some antihistamines as I was eating at a friend’s place, so I have no clue if they would make me react. They did taste quite good even washed in hot water. Poor guys trying to seduce a lady with strawberries while she is not allowed to eat them. There is overwhelming agreement over the low histamine content of apples, melons and rhubarb. While mango, pears and grapes all get mentioned as restricted by one of the dietary lists. Even though they’ve been OK’d by many other lists. In all cases what matters most is that the fruit is fresh, as bacterial activity breaks histidine down into histamine, so the more ripe the fruit, the more histamine it will contain. And I used the list I got from my nutritionist. Or maybe it doesn’t. Though to me it does sounds like a fun experiment: “Single and repeated air blast stress and brain histamine” didn’t yet read the article but did read the abstract. Exposure of rats to air blasts for 1, 5 and 15 min resulted in a significant increase in plasma corticosterone level and in the hypothalamic histamine concentration. Midbrain histamine content was increased after 1 and 5 min of exposure but cortical histamine increased following 1 min of exposure only. Stress of longer duration (30 mins did not significantly affect histamine concentration in any of the three brain regions investigated, although plasma corticosterone level remained very significantly (14.5-fold) elevated. Repeated exposure of rats to air blasts of 15 min duration resulted in a significant elevation of hypothalamic histamine concentration while midbrain and cortical histamine was not significantly altered. Plasma corticosterone level was again very significantly (10-fold) increased. Present results suggest the involvement of brain histamine in the response to stress. I guess I need to go and read the article. Though it’s probably a lot less fun than my current interpretation and imaginary visuals, which are more fireworky than I’m able to write down. I don’t think I want to know the boring truth. I’ll let you know when I change my mind. 😉 Anyone interested in the true story though? As said in my previous post what Histamine intolerance is, I mentioned that a histamine intolerance stems from a lack of the enzymes that break histamine down. If that happens histamines consumed with foods en histamine released from mast cells starts to build up within the body as it’s not broken down fast enough. This means that there are several ways in which one can try to get the symptoms of histamine intolerance down. The lack of these enzymes can come from a genetic problem, an injury in the gastrointestinal track, the inhibition of these enzymes or a shortage of certain minerals and vitamins that are used to create these enzymes. If the enzymes are inhibited by certain medicines, chemotherapy or the use of alcohol. This can be reversed if the factor inhibiting them is taken away. Restoration can be helped with the aid of those vitamins and minerals necessary for functioning, these can also help in any other instance if there is a lack of the enzymes. There are also supplements on the market that contain diamine oxydase (DAO), and can provide some relief. A third way is avoiding eating those foods that are rich in histamine. By following a diet. This is the main way a histamine intolerance is treated, and a way to diagnose it as well, but the diet can be pretty hard. 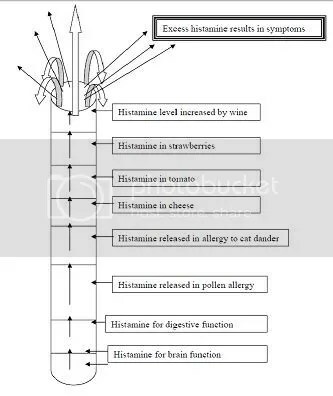 The fourth way, is to stop the histamine in the body from starting a reaction, this is what antihistamines do. They block the receptors histamine binds to, so no further reaction occurs. Vitamin C is well-known for its antihistaminic working, in this article the show that in a lot of cases blood histamine levels are directly correlated to the vitamin C levels, and that the intake of vitamin C will lead to less histamine in a matter of days.It functions as a cofactor of DAO, just like vitamin B6 does. Diamine oxydase, the enzyme that breaks down histamine in the blood and the gut, depends on vitamin B6 to function, so if a shortage of B6 arises, the enzyme is practically useless. The intake of vitamin B6 often leads to a higher activity of DAO, at least in vitro. Magnesium is also quite important in the histamine metabolism, a shortage increases the activity of histidine decarboxylase in some tissues. Histidine decarboxylase is the enzyme that makes histamine from histidine. While at the same time a lack of magnesium leads to lesser activity of DAO. Calcium is a mineral that is said to help combat histamine allergy levels, by flushing it out, or stopping the secretion, for both of these I’ve found some basis the literature, but it seems a rather complex. so I haven’t yet fully figured this out. Copper is another cofactor of DAO and able to reduce histamine levels. It’s not often recommended to supplement, but seeing its function, it could provide some relief. Zinc inhibits the release of histamine from mast cells. And is also sometimes mentioned as a supplement that can help. Manganese also inhibits the release of histamine from mast cells. And just like zinc is mentioned sometimes. So the main vitamins and minerals that can help, are vitamin C, vitamin B, magnesium and calcium. Vitamine C can be taken in a dose ranging from 1000 to 5000 mg. Vitamin B, one should be careful with, see my warning about it, I wouldn’t recommend going above a dosage of 25 mg, as 1 to 2 mg is enough. Magnesium can be taken up to 500 mg, I recently read this, about it causing diarrhea and what can be done if this happens. Calcium you can just add the recommended daily amount which is about 800 mg. There is also Histame and DAOsin, these are same thing, coming from Sciotec a company based in Austria, which found a way to extract DAO from porcine kidneys. They do contain some extra ingredients as stabilizers. So it can provide relief for a lot of the people suffering from a histamine intolerance and for some it can make things worse. Or doesn’t seem to work at all. The only way to find out, is to try. But the main way, which also helps in healing an injury or infection in the bowels or colon is to keep to a strict diet. Avoiding foods that can upset the gastrointestinal tract, those that are rich in histamine and those that are able to release histamine from the mastcells. Many diet examples can be found on the internet, though a lot of these have different opinions about certain foods and it can get quite confusing. Soon I will go into more depth with these lists, and do some more research on them. Hopefully that can shed some light on the matter. Since they make me crazy! I’ve been on the diet for about 8 months, and I permit myself quite some freedoms without having it affect me too much. Some things that aren’t good don’t set me off, as the threshold at which reactions start isn’t reached. But this also means, that I won’t notice those things I try to add to my diet, but that are bad even though they were mentioned as safe on some kind of list. For example I had started to eat some cheese again, it’s not recommended on the diet, but as one needs to try new things every so often so you’re not to restricted I tried it, just really young one the 24+ , one sandwich didn’t cause trouble another didn’t either, but when I started to eat it more often and more on a daily, since I love cheese, it became apparent that it made me really tired. One of the most important things is to diversify your food, and rotate often. So you don’t eat one thing to often. Histamine rich foods tend to be those that have aged and or processed. Bacterial activity converts the histidine to histamine, so the longer this bacterial activity can go on, the more histamine a food will contain. There are also some other foods that contain lots of histamine even when still fresh, like tomatoes and spinach. There are a lot of anti-histamines available on the market. In small dosages over the counter as hay fever medication. In general the main one recommended are those that block the H1 receptors. These are widely distributed throughout the body, and are the mediators in a lot of symptoms. Older generations easily travel across the blood brain barrier into the brain, where they also interrupt the histamine pathway that is active when you are awake, making you very drowsy and sleepy. I’ve got fexofenadine prescribed by my doctor. These are from a new generation and shouldn’t make a person drowsy. But of course they did, luckily the effect wore off within a month, and by taking them at night I slept rather well for a view weeks. H2 blockers are also often prescribed, these mainly regulate the secretion of stomach acid. And are often given in case of a stomach ulcer, or with acid reflux problems. But these receptors are also present in different parts of the body, one of the reasons they are also often prescribed to those with skin problems, like in case of urticaria. H3 and H4 are hardly ever used. H4 has only recently been discovered. And H3 has an inhibitory effect on histamine itself. It works as a negative feedback loop, to regulate the reactions histamine starts. Vitamin B6 is often mentioned as help to be relieved from high histamine levels, due to it’s important role in the breakdown of histamine by DAO. But I’d like to warn everybody, it is well-known that high dosages of vitamin B6 can lead to neurotoxicity, meaning that it kills of your nerves. What is less well-known is that even in lower dosages in can have detrimental effects on certain people. Which I experienced myself. I started taking about 25 mg a day, within a view days my limbs would often get numb, just like you get a sleepy leg or arm every now and then, but this was worse. They’d fall asleep constantly whatever position I took, I started to get tired and dizzy. And before I knew it, I was laying in my bed trying to find a comfortable enough place not to be bothered by the constant tingling and sleepiness of my body, while trying to remain conscious. Didn’t really help that deadlines and exams were coming up. Luckily for me, the effect didn’t last very long, as opposed to those people who get problems after taking high dosages for a long time, but it was still very uncomfortable and highly disruptive of my life. During the time I was able to stay awake, I googled like crazy, trying to find out what was happening to me this time. I soon found out about the toxic effects of B6, and that it can also have nasty effects in lower dosages in certain people. This can be due to a certain sensitivity in those people, but it can also come from a deficiency of other vitamin B’s and magnesium. Magnesium shouldn’t have been an issue, since I already supplement with magnesium. Maybe it was due to the lack of other vitamin’s, since well, I’ve stopped taking complete vitamins and complete vitamin b supplements. As these contain minerals and vitamins that can lead to a higher level of histamine and should be avoided in case of a histamine intolerance. Yes folic acid(B9), vitamin b12 and niacin(B3) I’m looking at you. So instead I’ve started to eat more foods that contain high levels of vitamin B6, the daily dosage is only about 1 to 2 mg, and the melatonin I often take also contains a view mg, so does the energy drink I often indulge in. And yeah I know caffeine is bad, the weird chemicals in it are also bad. But I need my caffeine dose and sugar dose, and I just love to drink them. When I don’t drink too many too fast it doesn’t affect me all that much. Though coffee and green tea, which both contain caffeine can make me feel very sick. So if you’ve started taking vitamin B6 and notice any side effects like numbness, dizziness and fatigue. Stop taking it! As this article grabbed my attention a while back, due to my own interest in histamine but also since one of my friends suffers from anorexia nervosa. It describes the case of a 20 year old girl, who suffered from gastrointestinal problems, headaches/migraine and asthma, she got through several medical examinations and therapies in the past years and had been diagnosed with atypical anorexia nervosa. After being put on the elimination diet she soon started to feel better, and gain weight. While looking further I came across some other articles talking about histamine and it’s receptors in relation to anorexia. Histamine has four different receptors, and depending on the receptor and locations of the receptor it can have different effects. Research on H1 receptor blockers (antihistamines) lead to the discovery that these play a role in suppressing food intake, as suppressing these receptors lead to an increased food intake. Whereas the blocking of H3 receptors lead to less eating, as H3 receptors often regulate histamine and it effects, working against the actions of the other H-receptors and also influences other neurotransmitter. As such H3 blocking antihistamines have been proposed to be used in the fight against obesity. These receptors can be found within certain regions of the brain like two of the important satiety centers. As well as around our food consumptions organs. Mastification, chewing, leads to activation of the histaminergic pathways but so does the oral intake of l-histidine (one of the precursors of histamine). In the article it is also mentioned that chewing alone leads to loss of fat tissue. But they can also be found and play an important role in the reward centers in the brain. In general it is assumed that it has a negative effect on rewarding systems. It also has negative influence on the excretion of dopamine and its neurologic pathways. To complement this all, it also affects punishment systems. So often disturbances within these systems can lead to abnormal appetitive and aversive behavior. There are also an article I found that mentioned an increase of brain histamine H1 receptor binding in patients with anorexia nervosa and females. And another mentioned an increased effect of histidine consumption in the female brain as opposed to the effect in the male brain. The former proposes that the larger occurrence of anorexia in females may be due to the increased histamine binding. I’s amazing how I’ve noticed some of these effects, I hardly ever felt hungry and a lot of the time I just ate, because I had to, and felt satisfied with only a few bites. During the worst times, I’d lose a lot of weight, making my friends very worried about me. Especially with one of us, and many other in our surroundings having anorexia. They still keep a close eye on my weight, making compliments whenever I see them, about any suspected weight gain. Gaining weight isn’t that hard anymore, since after I started the diet, I became very very very hungry, I felt starved all the time. I’m often a big eater, but I’ve started eating immense amounts of food from that time on.